After reception, the biomass is cleaned and crushed first. Hereafter the biomass puree is transported to the Betaprocess for pre-processing. 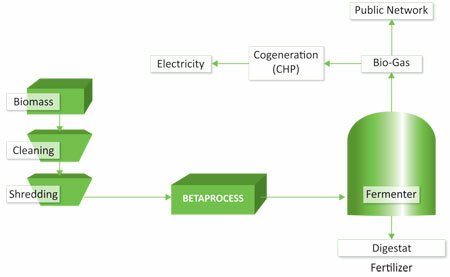 Pre-processing takes place in the Betaprocess. First the puree is warmed up to the desired temperature. Then, In the Betaprocess’ special reaction vessel, a reaction takes place under vacuum conditions at a temperature between 60 and 65°C. During this reaction the cells of the biomass material ‘explode’. Hereby, the fibres, cell walls and cell membranes are ripped apart, allowing bacteria and enzymes to obtain direct access to the sugars and other cell ingredients. The degradation of macrostructures actually takes place in a fraction of a second only. Afterwards the biomass puree, which meanwhile has reached the desired temperature of 40°C, is pumped to the fermenter for the further course of the fermentation process and the formation of bio-gas. This bio-gas can either be used for generating electricity with support of a cogenerator or directly be injected into the gas grid.